The good news is that despite a highly challenging (if not seemingly impossible) schedule, even gymnasts at the highest level can attain academic excellence. Olympic gymnasts have gone on to glittering professional careers as a result of their top level exam results. Examples include politicians (90s US gold medallist Kerri Strug), lawyers (seven time Olympic medallist Shannon Millar and doctors (Amy Chow – a Kerri Strug Olympic team-mate). So, it IS possible to balance gymnastics and school and be successful at both. However, such an ideal outcome doesn’t happen by accident. Now a qualified lawyer, iconic Olympian Shannon Millar insists that excelling at gymnastics and school are achievable with the right mind-set. According to her the secret lies in good time management, setting priorities and finding creative ways to maximise what might otherwise be empty space. This can include completing homework on car journeys to and from the gym, meets or competitions. In one of her videos Shannon explains how balancing rigorous training with school work taught her not to put things off – a lesson she has continued to use with great effect throughout her life. A further tip of Shannon’s is to stop thinking of it as school v gymnastics but rather as a mutually beneficial set-up; a combination in which each enhances the other and makes for a multi-dimensional individual. School work such as maths and physics can lead to a greater understanding of gymnastics while the life skills and tools learned through working towards gymnastics excellence come in handy at school too. Working mind and body together tends to lead to being better at each. The trick is to find a way to balance gymnastics and school work. The multi-dimensional element of a gymnast’s life can also serve as an emotional distraction, in a positive way. It is hard to keep dwelling on an upcoming school exam when a gymnast is fully thinking about a new bar routine for example. And likewise any butterflies about an approaching gym competition are going to be put aside while concentrating on a maths problem in class. The ultimate message is school comes first. No matter how brilliant the gymnast, the sport is not forever whereas education is. There has been considerable research in the US about the link between academic success and sports. Findings from such studies – such as that published in the South Dakota State University’s Journal of Undergraduate Research – suggest that heavy commitment to a sport is far from being an impediment to educational achievement. In fact it can actually enhance it. The skills of discipline, dedication and commitment which a child learns as part of gymnastics training can transfer positively to the classroom setting. This results in greater academic success and higher than average grades, especially when compared to non-sport participant peers. If you want to read one of the studies for yourself you can find it here. AN EXTRA BOOST IN MATHS, PHYSICS, BIOLOGY AND P.E. As most coaches will tell you it is hard to understand gymnastics without some grasp of maths, physics and biology. Maths crops up in every single training session, whether it is understanding possible deductions from a routine and working out scores, deciding whether a beam turn is 180 or 360° or the angle at which the body needs to strike the vault to get maximum flight. The laws of Physics also need to be applied to arrive at successful execution of moves and can be used to explain exactly why a gymnast has landed on her backside instead of her feet. The mechanics of gymnastics is ALL about physics. Physics language such as centre of gravity, momentum, speed, balance and resistance are commonplace in the gym. As a result even very young children learn these concepts quickly because they constantly see them through practical experiment and examples. Likewise human Biology is a subject which features highly in gymnastics. It will all depend on the teaching methods of the coaches but it is not at all uncommon for young gymnasts to be able to name a variety of muscles, how they work and to have an understanding of soft tissue components such as ligaments and tendons. As feeding the body to maximise its performance is also an essential element of the sport, gymnasts tend to know more about nutrition than their peers of the same age. Finally there is PE which many gymnasts find a walk in the park because of their training. 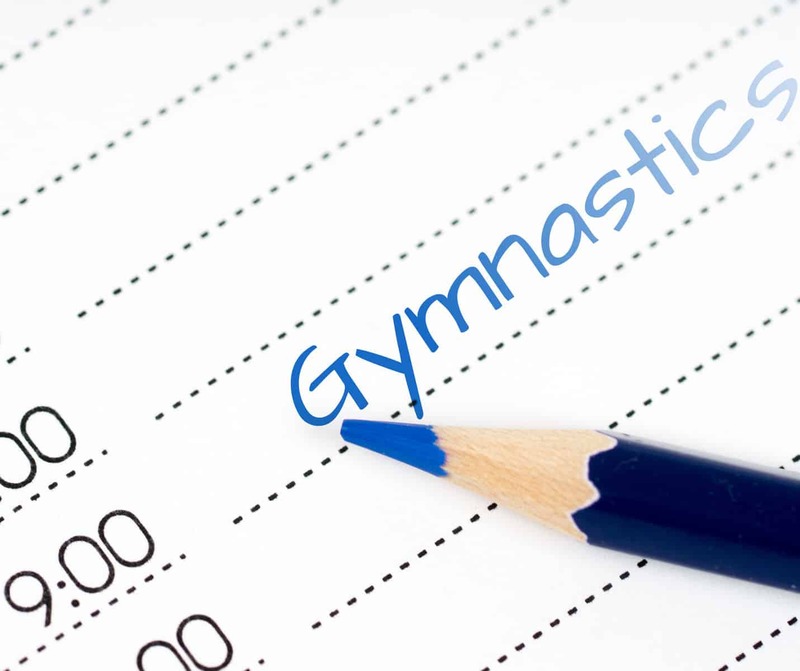 Although GCSE PE only affects year 10 and older pupils – a level which falls well down the line for most female gymnasts – many GCSE governing bodies will allow participation in sports outside of school to count towards at least some of the final grade. The advice from Olympian Shannon Millar is always to remember school work comes first. There might be times when you miss classes through your gymnastics schedule – because of a competition for example. However, it is important to remember gymnastics is after all a sport and temporary part of life while the benefits of education are going to serve for a lifetime. It is important that everyone involved understands the situation. Talk to teachers so they are aware of the overall demands being placed on your child. This will hopefully lead to a sensitivity of support and also being watchful for any signs of stress or problems. Depending on the school, you can sometimes agree special provisions for things like arriving for an exam at a different time for example, or allowing different time scales for school projects if they clash with an important competition. It is equally important that coaches know if your child is under extra pressure. This may be because of an approaching exam or some big project. At the times of the heaviest demands on your child some coaches are ok with arriving a little late. Or leaving a little early. Others might be able to suggest part of or even an entire session which they could skip without much negative impact. For more tips on dealing with coaches, read our article. This point is one of Shannon Millar’s key tips. The same advice appears over and again on the Chalk Bucket forum from gymnasts, ex-gymnasts and coaches. Getting into the habit of putting things off just tends to lead to falling behind. Or in other words help your child to learn how to use their time wisely. In the words of one Chalk Bucket gymnast ‘just never do nothing!’. A lunch hour or even 15 minutes of it can be used for a spot of study or homework; a school assignment can be completed on a 2 hour train journey to a competition; reading can be done while you hold your splits practice; homework can be done in the car going to and from the gym and so on. With so much going on it can sometimes be hard to keep track of things and miss deadlines. Effective time management is a key element in helping to balance gymnastics and school successfully. To keep on top of this, many gymnasts use a planner. This way they can see at a glance where there are any gaps. It can be a diary or a good old fashioned wall chart, but the multitude of planner apps available for phones (many of them free) might be more appealing. This point ties in with the communicating with teachers one. Depending on your child’s regular gym schedule, it might make sense to ask for minor adjustments. If their teacher normally sets homework on Mondays, perhaps you could agree for them to give it on Fridays instead. Then they can use their weekend to get ahead from the outset. It’s a good idea to discuss with your child what they should do if they start feeling snowed under. Getting help before things escalate is always easier then untangling a big mess at a later stage. Be aware that many high achieving children might see asking for help as a sign of failure. Be on the lookout therefore for any indications that all is not as it should be. Although you will best know what to look for in your child, some signs of concern are declining grades, a loss of enthusiasm for gymnastics or irritability. Once-upon-a-time home-schooling was a fairly radical concept. However, more and more parents are now taking this option for a variety of reasons. Whilst this might seem a scary prospect, the network is now so vast you are never going to be alone. Home-schooling allows the ultimate maximisation and most flexible scheduling possible for your child. While there is plenty of evidence to suggest excellence in both gymnastics and school is indeed possible, there is another element here which might interest you. There is an enormous amount of evidence to suggest that, on average, gymnasts are smarter than their non-sporting peers. Why? Because studies have shown there is an inseparable link between physical activity and the development of the brain. Physical activity – especially complex activities such as gymnastics – triggers a brain process that strengthens and expands neural networks. In short, gymnastics puts the brain at optimum conditions for learning and enhances academic achievement as a result. If you want to know more take a look at this study published in the British Medical Journals.